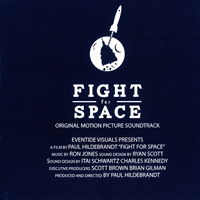 SkyMuse Records presents the original motion picture soundtrack for the documentary FIGHT FOR SPACE. The album features original music composed by Ron Jones (DUCK TALES, FAMILY GUY, STAR TREK: THE NEXT GENERATION, AMERICAN DAD! ).Directed by Paul Hildebrandt, FIGHT FOR SPACE centers on the Space Race in the 1960s and 70s and examines how it inspired a generation to pursue careers in science and technology.